If you live in an urban area, you may’ve noticed your sidewalk is a little busier than usual. Not just as a result of downtown revitalization or roving millennials. New modes of transportation are literally popping up overnight. 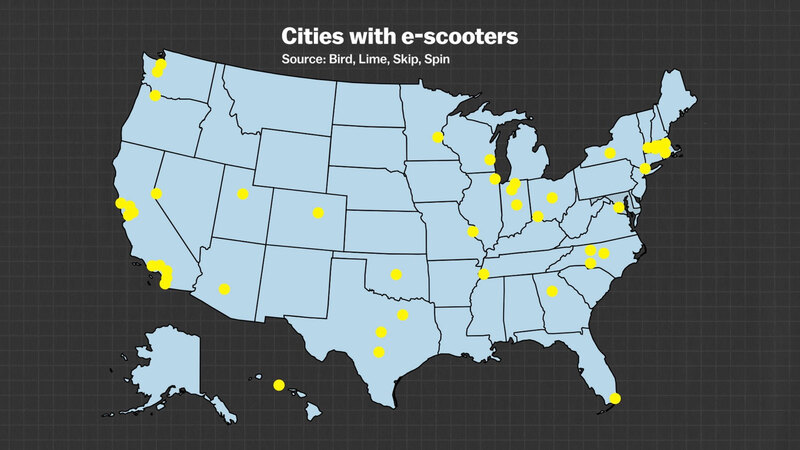 More than 80 American cities had dockless electric scooter rentals on their streets as of Aug. 2018. 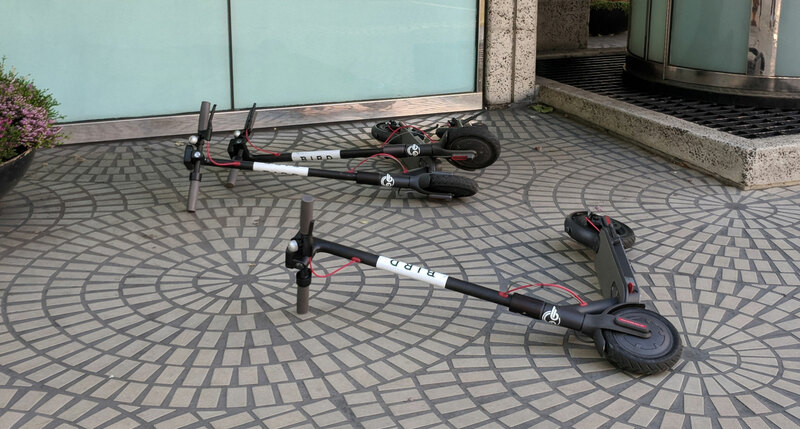 Provided by companies like Lime and Bird, dockless electric scooters have begun to litter city streets. How you feel about them may depend on whether you ride them or not. For the scooter user, the zippy machines can shorten a 20-minute walk into a 5-minute ride for just a few dollars. As a result, scooters have been used for millions of rides since they first appeared in mid-2017. Pedestrians, meanwhile, find themselves facing new hurdles, sometimes literally: not only do they have to bob and weave to avoid collisions with the 38-lb vehicles, but riders are pretty much free to leave them wherever they please. The result is a hazardous mess, as shown below. Investors are betting big on the future of scooters — startup Bird doubled its valuation to $2B in just four months — and it looks like scooters are here to stay, even as some cities enact moratoriums while they tackle how to best regulate them. But are scooters the enemy? Some urban planners think they are a natural outgrowth of a deeper problem about how we get from place to place. Scooters, in fact, could be just what we need to force a bigger conversation about making our streets a better experience for everyone. The fight over electric scooters is really a fight over who controls the sidewalk. And the reason we’re fighting, is that there is so little space to go around. How did American sidewalks end up so small? And so unwalkable? It wasn’t always this way. Before cars changed the face of the country, pedestrians, cyclists, horses and yes, cars, shared a single throughway, which functioned as a dynamic public space for commerce, socializing and travel. There were no sidewalks because people understood how to navigate, and speeds were relatively low. But as cars got bigger, faster and more essential, the binaries that are now so familiar began to develop. Sidewalk vs. street. Suburb vs. city. Over the years, congestion and demographic changes have made our current set up unsustainable. 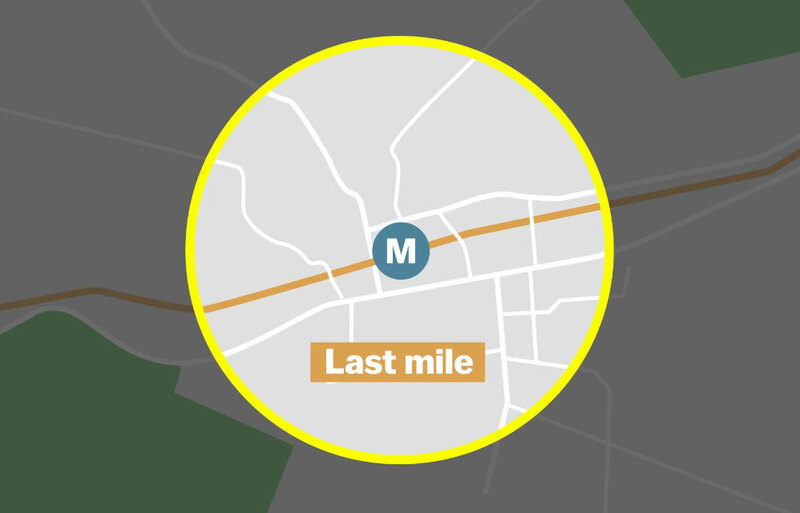 That’s the phrase planners use to describe the distance between a transportation hub (the train station, let’s say) and the final destination (your front door). It’s a riddle that’s plagued businesses and individuals for a while. There are lots of easy ways to ship goods thousands of miles, from one port to another, for example. But it’s far more difficult to figure out an equally cost-effective way to deliver those goods to a particular shop or someone’s home. That last mile can take up as much as 28 percent of total transportation costs. Hypothetically, for the individual, cars are very good at solving this problem. Or at least, we’ve gotten used to thinking of them that way: 60 percent of trips of a mile or less are made with private vehicles. But urban congestion has now reached a point where cars are a less viable option for everyone. Software engineer and data analyst Todd Schneider found that more than half of peak hour taxi rides in New York City would be accomplished faster if riders had opted to use the city’s bike share program, CitiBike, instead of taking a taxi. And it’s not just New York. As the country urbanizes, commuters everywhere have the same challenges. In large urban areas, getting between work and home is a struggle. Commuters have to fight for a parking spot at the train station, wait for a bus or hail a ride. For a nation designed around the automobile, more people in the United States are dependent on public transit than you may think. Junfeng Jiao and Chris Bischak at the University of Texas at Austin study transit in American cities, and have found that many urban areas are “transit deserts.” That is, the demand for transit far exceeds the supply. 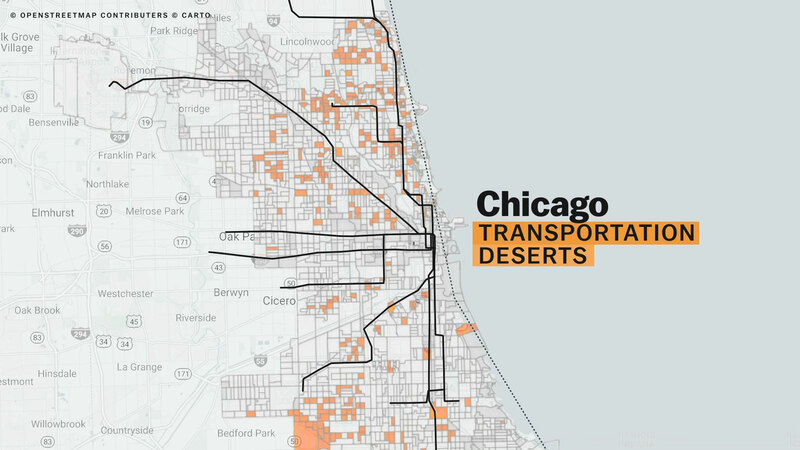 Orange areas represent Chicago's transit deserts, places where transit supply cannot keep up with transit need. Even where transit demand is met, a surprisingly large percentage of people are dependent on public transit — as much as 38 percent in places that aren’t transit deserts. They are too young to drive, have a disability, can’t afford a car or have otherwise decided not to own one. In transit deserts, the number of people with unmet transportation climbs even higher: 43 percent. Not surprisingly, scooters have dropped in many of these same cities, offering a new transit option in a place where demand outstrips supply. 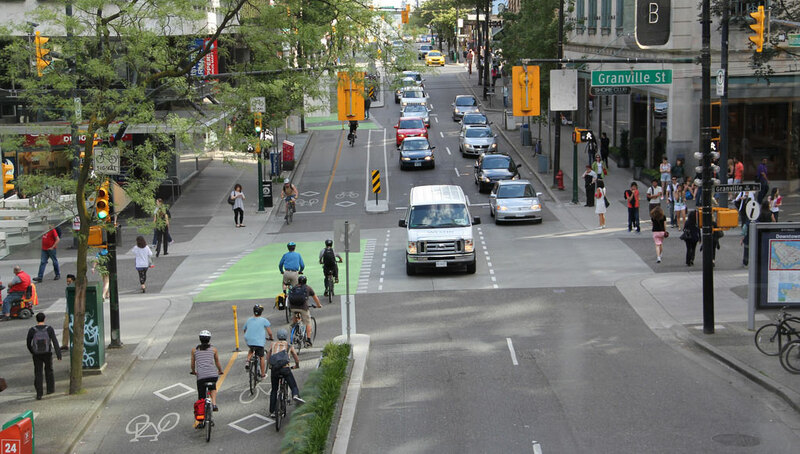 A complete street with a two-way protected cycletrack in Vancouver. It would mean a radical rethinking of the shared space that is now divided between the street and the sidewalk. The design of these new roads would likely end up looking a lot like old roads. Really old roads. And while the roads of the early 20th century may seem chaotic, the 21st century version has the potential to be way more organized, and safer. Expanding sidewalks to accommodate scooters would accommodate a number of other modes of travel and social functions, too. So next time you see a scooter, don’t think of it as a new problem. It might just be the catalyst we need to create a much better solution, for everyone.